It’s that time of week when everyone gets lazy, slacks off, and procrastinates. Which includes me. I know it’s late, but may I entice you with this yellow RS? 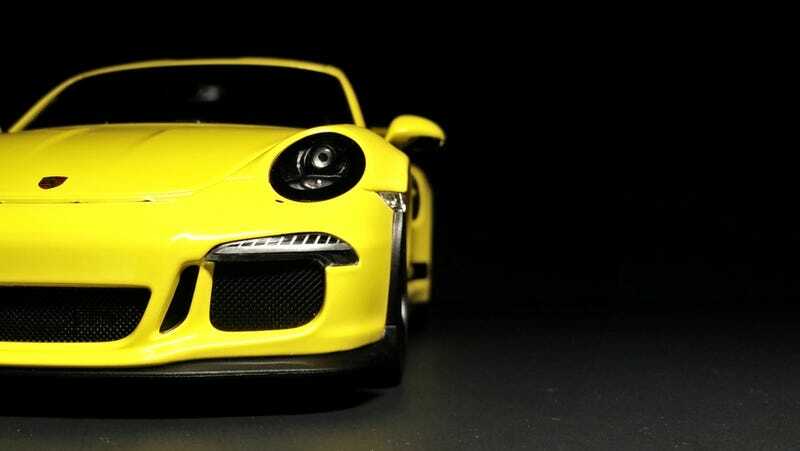 What this is is the Porsche 911 GT3 RS. When browsing the market, you have a plethora of options at hand. Wanna get ripped off? Get the Spark. Wanna be a scalper? Get the GT Spirit. Wanna be a smart and sensible collector? Get the AUTOart. Wanna be impatient while waiting for the AUTOart to release? Get this one. This Minichamps is also the most budget-friendly option and overall provides great value for what it is. It’s still constructed in diecast but does not have any opening features, part of MC’s latest line of “entry-level” models. Wheels have long been a point of contention with 991 GT3 RS models, and I feel that none of the manufacturers have gotten them correct to the 1:1. Still though, the model looks quite striking with the black decals to match those wheels.